Duddle Puck's not your average duck. He likes to do things his own way, and that includes how he chooses to communicate. Everyone knows that ducks quack. Well, not Duddle Puck. 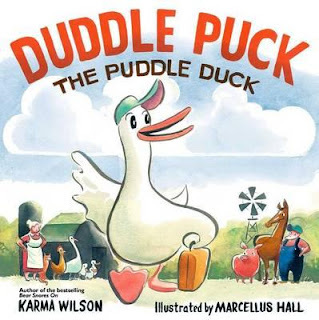 Duddle likes to cluck like a chicken, honk like a goose, oink like a pig, neigh like a horse, and even say the odd 'Hip-hip hooray' to the farmer and his family. The other animals don't like this. As far as they're concerned, horses neigh, pigs oink … and ducks quack. Clearly Duddle Puck needs to be educated. Will Duddle Puck do what's expected of him? Or will he stay true to the unique duck he is? Told in rhyming text, this is a cute story that should give parents and kids plenty of opportunity to imitate their favourite farm animals. QUACK!